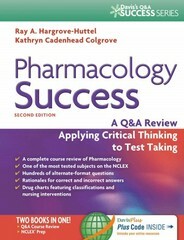 Pharmacology Success 2 Edition TWO BOOKS IN ONE!Course review now. NCLEX-prep later.1,000+ critical thinking questions (both multiple choice and alternate format) organize the seemingly huge volume of pharmacology information you must master into manageable sections divided by body systems and specific diseases. You’ll not only learn to associate the medication with the disease process, making learning easier, but are also be to evaluate your knowledge of medications prior to taking exams.All of the questions encompass the basic concepts for medication administration, including why the client is taking the medication · when the nurse would question administering the medication · how the nurse knows the medication is effective · and what interventions the nurse needs to teach the client concerning the medication. "I love that the questions come with rationales and that the books are filled with relevant questions! Tons of people in my class use them and without fail we rave about them after each test! "—Taryn Van Rensburg, Student Nurse at Naugatuck Valley Community College, CT.